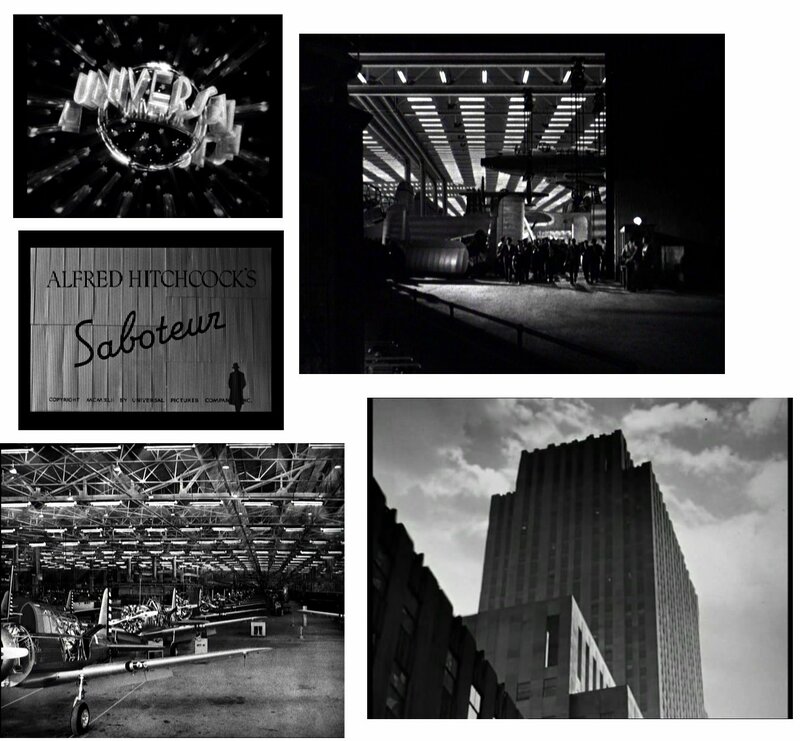 Alfred Hitchcocks' "SABOTEUR" (1942) remains one of my favourite Hitchcock thrillers. The tried and true formula of the innocent man on the run is handled with style and breakneck pace. The uncredited special photographic effects work of the great John P.Fulton remains among the best in all of Hitchs' films in my mind. The sheer number of matte paintings and complex optical work including rotoscoping is staggering. 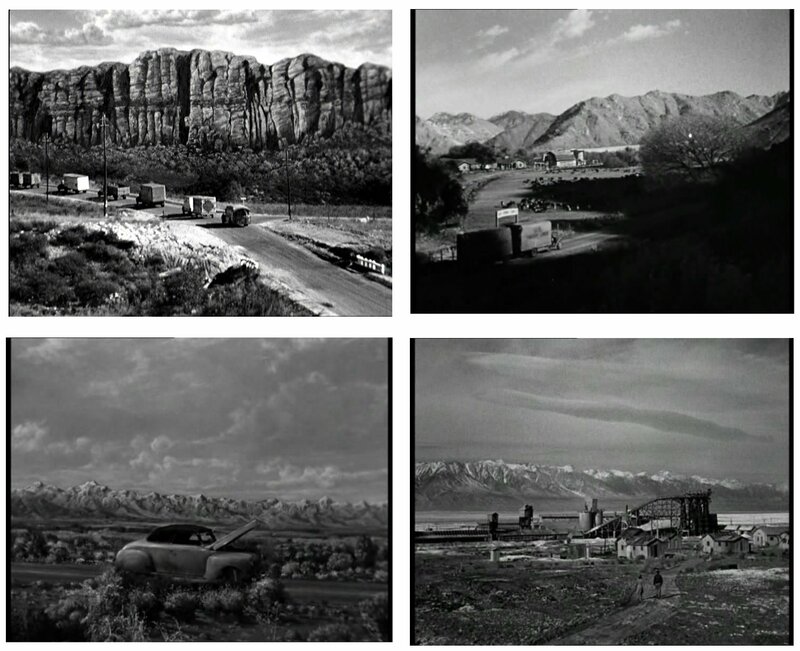 All the more staggering is that as far as I could ever learn Universal only ever seemed to have one matte painter on staff - Russell Lawson, later to be succeeded in 1961 by Albert Whitlock. In the early days and the 30's Jack Cosgrove teamed with Lawson on many films such as "BRIDE OF FRANKENSTEIN", and "THE INVISIBLE MAN" and others, but for the most part from the late 30's through to the early 60's it just seemed to have been Lawson. ***For a special tribute in pictures to the career of matte painter Russell Lawsen, click here. 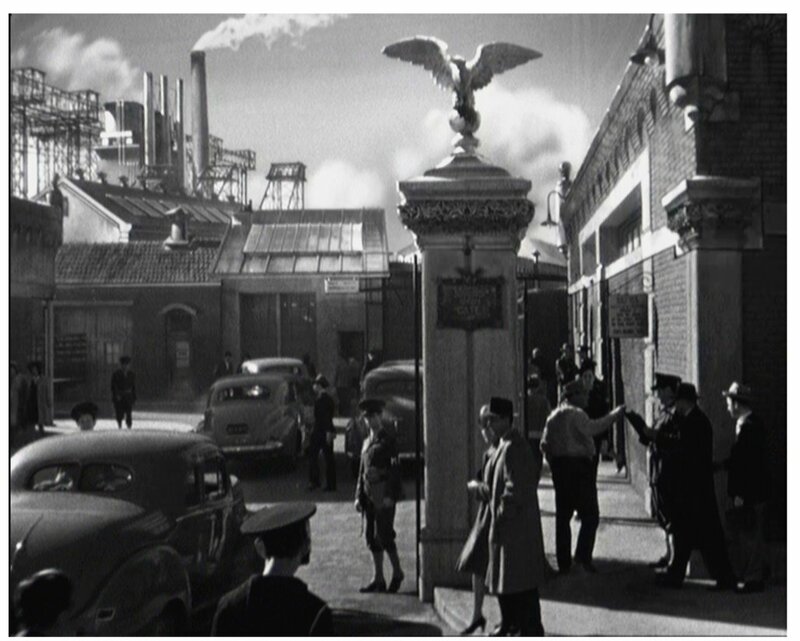 The memorable opening sequence from "SABOTEUR" with the slow opening of those huge metal doors revealing an aircraft armaments factory (top right) - a superb, forboding visual effect shot. The actual shot at lower left of the planes may be real (?) though I feel due to wartime security such a shot may have not been permitted by the military? Upper frame - guy being immolated - what appears to be a large scale miniature set on fire with a beautifully rotoscoped guy being pretty much vapourised in the inferno....fantastic effect!! Rotoscoper Millie Winebrenner had a very long career at Universal - from the Fulton era right through to the Whitlock era in the late 70's. 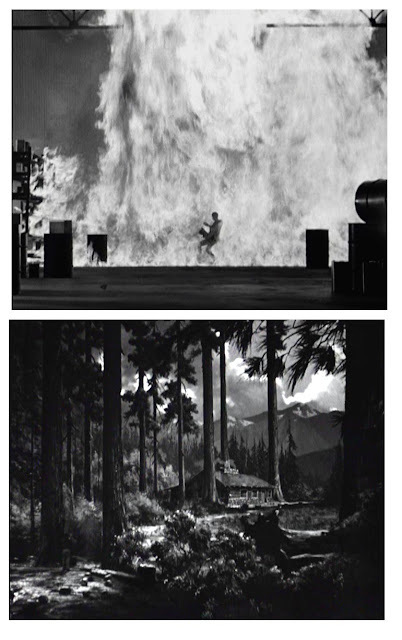 The lower shot is a wonderful full frame painting with just a small insert of Robert Cummings approaching the cabin. Four matte shots from the cross country chase sequences. The classic ballroom matte - frequently applied throughout the 30's and 40's - and beautifully executed here. One of my favourite mattes from the film - almost all paint with a soft blend running almost diagonally across the frame just above the heads of the actors, with even much of the foreground statue etc painted in by Lawson. Smoke inlays from the chimneys add to the final stunning effect. This is what matte painting is all about friends! 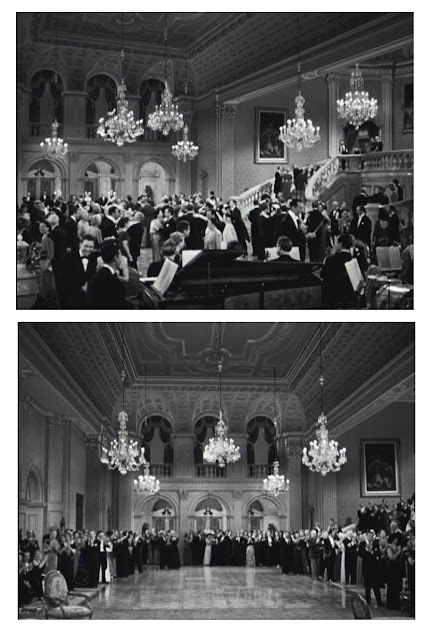 For years I'd never noticed this shot as a trick shot and only on the 6th viewing or thereabouts did I deduce that it is in fact a masterfully executed split screen with almost everything added by Fultons' photographic effects dept. The blend is perfect and the shot is massive in it's scale and drama. 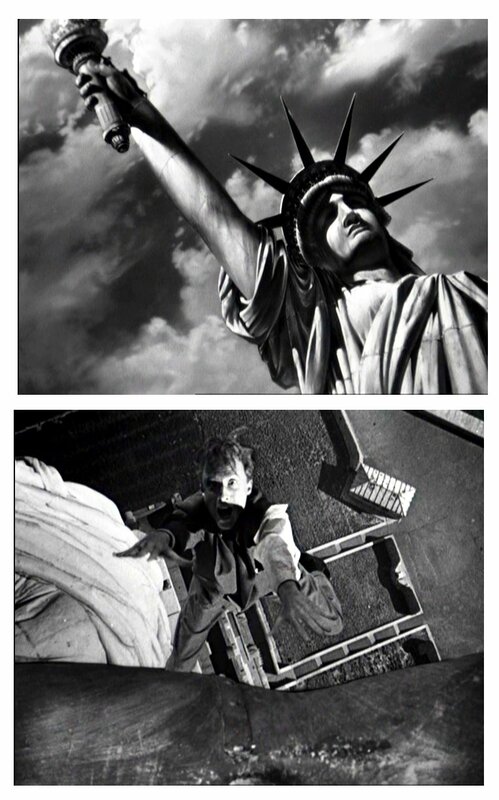 The stunning and riveting Statue of Liberty climax. I've seen this on the big theatre screen and it looks great. A multiple component matte shot with foreground actor on limited set on the stage at Universal, a soft matte line isolates the small set and adds in a two part composite consisting of Russell Lawsons' NYC painting and skies with a real water plate. I'd always imagined this sort of comp to be a nightmare to blend invisibly - to run a matte through the sky like this with no fixed 'lines' to adhere to - and it is visible but quick editing and general excitement of the moment hides the split. 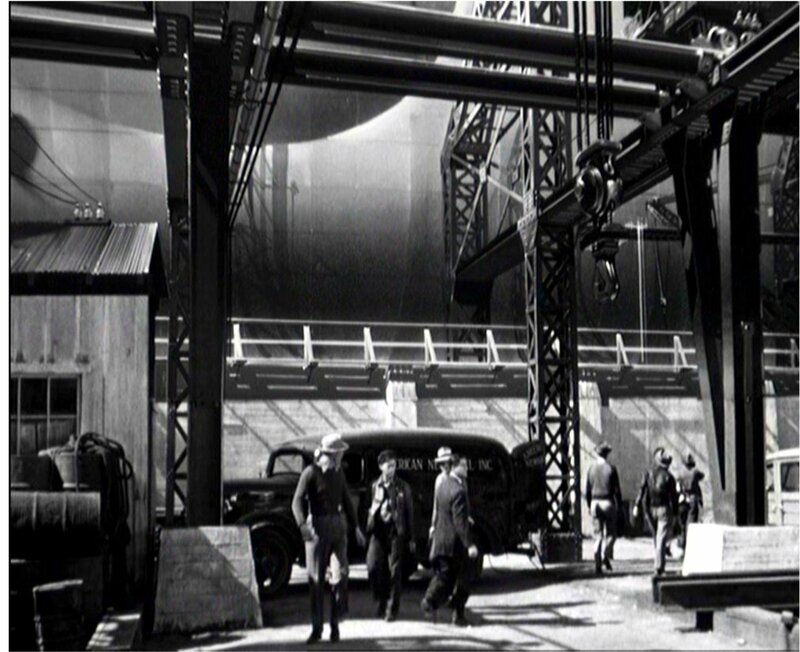 Another of several fantastic, moody and thrilling matte shots from the same set piece - one of Hitch's best bits of business! Just love this shot so much. Tremendous matte shots from the same climax. 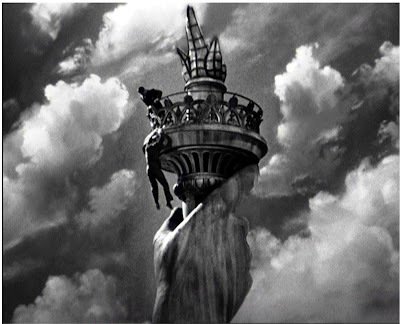 The actor is seen to slip down halfway through the matte line at one point and his legs disappear from view - but it takes several viewings to spot it. The end - Norman Lloyd falls to his death - a blue screen comp with Lloyd attached to a sort of a chair which was manipulated and tipped back as he was filmed in front of a blue screen by Fulton. 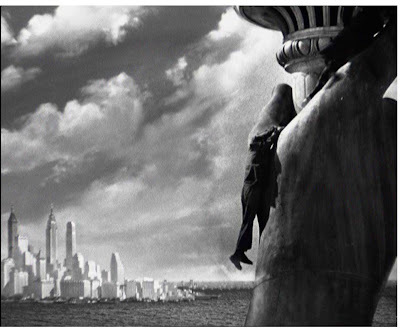 Terrific sense of gravity and weight as he 'falls' - an effect Fulton replicated later in "Rear Window" and "Vertigo". Mention must be made of long, long time Universal matte cameraman and optical composite expert Roswell A. Hoffman who put together all of the opticals and mattes not just in "Saboteur" but in practically every darned Universal picture from the 1930's up until his final film "Earthquake" with Whitlock in 1974. I wished that author Craig Barron had interviewed Hoffman for his indispensible tome "The Invisible Art - the Legends of Movie Matte painting" as he was still alive at the time. I read an interview with Roswell Hoffman many years ago. It was written for Dennis Skotak and the interviewer took out a copyright on it, which wasn't why Dennis set it up, so it was never published. Unless I'm thinking of Robert. Anyway, there is one, and very interesting it is. I'd sure love to read that interview. Ross was the silent partner in thousands of great Universal photographic effects for several decades. My father's (John DeCuir Sr.) first job at Universal (before he won his three academy awards for Production Design, KING & I, CLEOPATRA, & HELLO DOLLY) was working for Russ Lawsen. (who spent a good deal of time on the roof sunbathing while dad painted mattes ;-)) If you take a close look at John's painting style and hand work its pretty easy for the discerning eye to determine who was the author of the statue of Liberty matte work, Bob Boyle THOMAS CROWN AFFAIR, NORTH BY NORTHWEST (was Art Director although the Supervising Art Director Jack Otterson was credited Bob was credited as associate art director.) Bob confirmed Dad painted these mattes (many times) while we were teaching at AFI together. 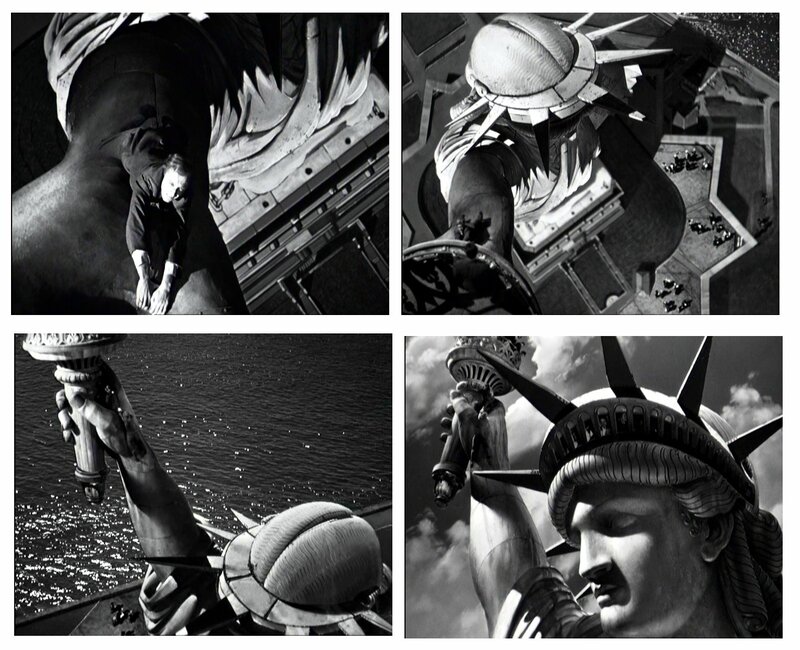 I have the original B&W stills of work on progress on this sequence in Dad's early portfolio of matte work. Why a matte shot blog?? ?